Automatic Mechanical Lock Arms on Non-Hydraulic Slideout Rooms - Paddle Style, and more! Chassis Battery Disconnect, and more! Large Non-Ventilated Living Room and Dinette Windows, and more! Roof Air Conditioning Drainage System, and more! Transfer Switch with Surge Protector, and more! Hot Water Line to Generator Area*, and more! Extended Rotation Concealed Hinge for Washer/Dryer Cabinet Door, and more! All Electric with Portable Induction Cooktop, and more! Safe Located in Bedroom Wardrobe, and more! 10 Bc Fire Extinguisher, Smoke Detector, Propane and Carbon Monoxide Detector, and more! 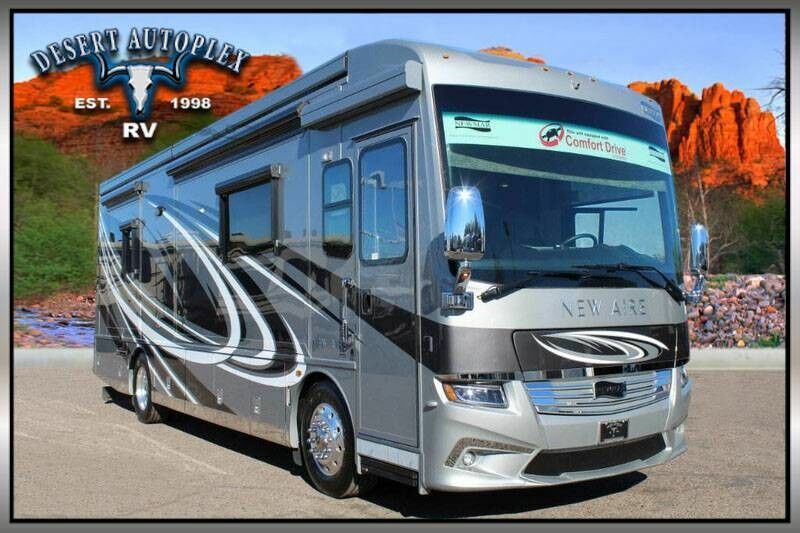 You do NOT want to miss your chance to own this stunning 2019 Newmar New Aire 3341 Quad Slide Class A Diesel Pusher. Financing is always available on approved credit, and we will even walk you through the unit to show you how everything works if you're not familiar already. HURRY, and call our professional sales team toll free at 1.888.385.1122 before it's too late, and you miss your chance!